The Non-Hazardous Waste Manifest comes in a snap-out format. 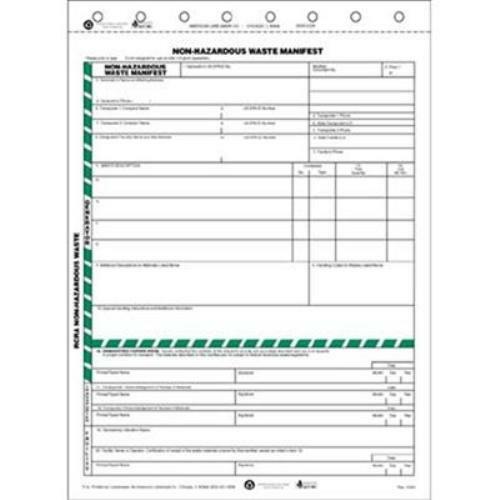 The snap-out forms are available in 8 1/2" x 11", 6-part form for non hazardous, sold per each. The Non-Hazardous Waste Manifest form minimizes the likelihood that non-hazardous waste will be mistaken for hazardous waste. The Non-Hazardous Waste Manifest form helps ensure that non-hazardous materials are not classified as hazardous materials when both are contained in the same shipment. The Non-Hazardous Waste Manifest comes in a snap-out format. The snap-out forms are available in 8 1/2" x 11", 6-part.